It wasn’t easy tracking Marzoug down at this year’s Womud festival at Charlton Park. 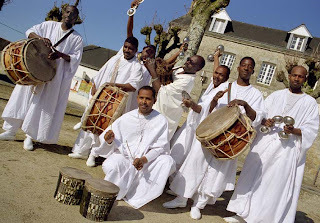 Their top-to-toe all-white desert garb makes for an impressive visual focal point in an energetically mobile stage performance, the eight band members twirling and swirling their robes to the spiralling notes of leader Jelloul Soudani's checkwa (Algerian bagpipe) with vigorous support from tabla drums and qarqaba castanets. But the striking get-up was not exactly conducive to getting about in the six inches of gloopy mud that bedecked the festival site, although whatever oasis of grass they managed to colonise clearly did the trick because they remained immaculate throughout their two high-octane performances, and I finally caught up with them after the second of those performances as they perched on the backstage steps of the Siam Tent waiting for one of the overworked artists' buggies to take them back to dry land. "We come from Biskra, which is to the south of Algeria, from what they call the doors of the desert," they explain (the conversation is as head-spinning as their performance, each member chipping in with thoughts and observations, translated from French and Arabic by manager Halim). "The neighbourhood we live in is called Sudanese El Alia, which helps explain the African rhythms. This is ancient music that we play in Biskra, which we call 'durs'. Our culture takes many influences from all around because Biskra is such a vital commercial centre, caravans have always come from everywhere carrying Berbers, Bedouins and Africans - so, the influences are Arabic, African and even Barbarian! Some people say the music itself has been around since the first century, but we think that the chekwa might have originated in the Middle Ages during the Christian Crusades when the Franks came to Palestine to force the Muslims out. They will have brought the cornemuse (bagpipe) with them." As for the sound produced by the checkwa, it is a distinctly high Arabic homophonic tone but there are echoes of the Celtic and possibly even Balkan roots in the melodies produced by those extra reeds. "Yes it is a bit similar," agrees Jelloul, "but technically it's not the same, our modes are unique and we don't have the drone sound you get with Scottish bagpipes, for example. But everywhere we play people love what we do and say that they can hear similarities in the music. We've played in Switzerland, France, Germany, England, Ireland and the reception is always great. In Brest we played with [legendary Breton pipe player] Patrick Molard. He asked to meet us after picking up some records in Algeria. His biniou looks and sounds very similar to the checkwa, it is clear that here is a common history." It's not all wailing bagpipes - there's a rocking backdrop to each song, an exuberant, polyrhythmic attack that grows in an intensity matched step by step by the organised chaos of the constantly interchanging dance steps of each band member. The boys really know how to make full use of a stage unencumbered by cables (a microphone for the occasional vocal track being the only plugged-in instrument). "The tradition of the drums come from the family Diwan [traditional devotional ceremony with song and dance]," they explain, "where we sit around and play drums, all day all night, seven days at a time, until we are in a trance. The songs are love songs and ones about the saints, some traditional, some written by the family. We like to mix things up a bit." This feature first appeared in fRoots magazine.